Bar Lev High-Tech Park is an innovative high-tech complex situated in the stunning Western Galilee heights. We aspire to lead the northern high-tech community forward by creating a fertile ground for cutting edge innovations, creativity and growth, alongside government financial incentives. The park is designed to provide its clientele with a unique environment which combines business & technology with access to diverse entrepreneurial community. The park, which is located in the Western Galilee heights is smartly planned, with its sustainable architecture, landscape development and advanced environmental standards. Eight buildings available for rent, totaling 90,000 square meters of space. Plentiful parking, for the benefit of employees and visitors. Innovative complex dedicated exclusively to the high-tech industry, with all buildings designated for renting. Personal Customization. design your own working space to fit your company’s needs, together with our architect. Increased capacity within the park possible to meet your company future growth. Built with top construction standards. Bar Lev High-Tech Park offers the full professional experience of a contemporary working environment, in order to help you promote the success and growth of your business. Bar Lev High-Tech Park is a part of Bar-Lev Industrial Park, which provides an excellent infrastructure for advanced services. The park hosts its own café and restaurant and will be launching a gym, an auditorium and childcare facilities in the near future. Within a few months, entrepreneurs, start-ups, small companies and freelancers will be able to enjoy the experience of a high-end co-working venue and benefit from beautiful meeting rooms, administrative services, high-tech Meet-ups, enriching lectures, professional workshops and more. Located in the central building at the heart of the Park, is Café Ritual a unique coffee shop that stands out in the northern landscape. Each day, the park’s residents and guests can enjoy exquisite coffee alongside a superb dairy menu prepared by our own chef Hagit Stern. Stern comes with vast experience and passion for baking, using only the highest-quality materials. In Café Ritual you can find rich salads, sourdough-bread sandwiches, excellent quiches and a wide range of sweet and savory pastries such as croissants, brioche, cookies, and Hand Made cakes. The professional & courteous air of the café makes it an ideal setting for a quiet business meeting or a relaxing coffee break, while enjoying the lovely views of the Western Galilee heights. In addition, the café offers Take Away trays for company meetings and other professional hosting, delivered right to your office. In the central building of Bar-Lev High-Tech Park, you will find the Park’s restaurant. The restaurant serves beef and poultry dishes within a beautifully designed space. The restaurant is operated by the Nir Etzion company, known for their high-quality food and fresh home-cooked dishes. 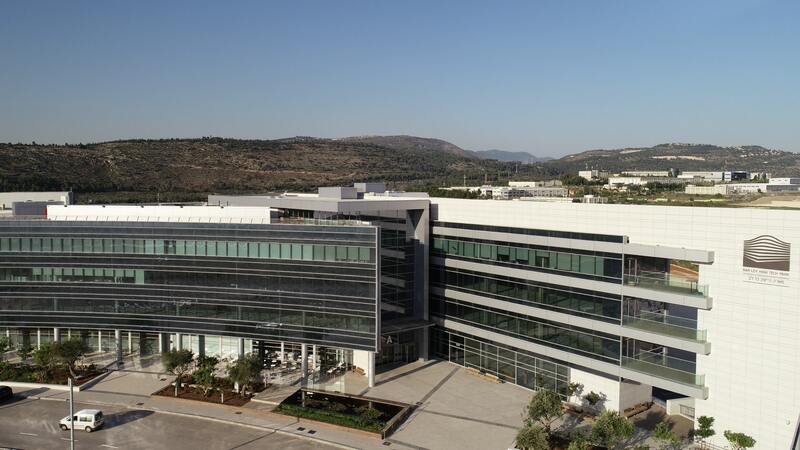 The Bar-Lev High-Tech Park is located in the heart of the Galilee but it is well served by major travel routes. The Carmel Tunnels and the new Krayot bypass road have significantly reduced the journey time from Haifa and the coastal road, and the new northern section of Route 6 will end just one junction away from the Park. In addition, the Park is located close to the Ahihud railway station, which is on the new line to from Acco to Karmiel. Direct trains run every hour between Central Israel and Karmiel during peak times, facilitating a fast and comfortable journey to and from work at the Park. There are shuttles to and from the station from the Park, synchronized with the train timetable. Within the next few months, the park will introduce WorkPort - a co-working venue dedicated to the high-tech community of Northern Israel – entrepreneurs, small companies, local start-ups and high-tech freelancers that usually travel to the central district in order to be part of the high-tech ecosystem will now be able to find a local venue to suit their professional needs. WorkPort's main purpose is to bring together a powerful business community that will benefit from an environment which encourages innovation & growth. The contemporary design and functionality of the space will serve all the needs of its members, allowing them to enjoy a productive, pleasant workspace, direct access to conducive business networking alongside professional workshops, enriching lectures etc. Imagine a technology park that will serve as an innovation hub, bringing an economical upsurge to Israel’s northern district. A park that is constantly growing, providing more and more people with the opportunities to create and develop. A cutting edge center, ideal for high-tech companies and exciting start-ups, with the goal of bringing the forefront of innovation up north as well as appealing to the talented population of the district. For companies, this is a magnificent opportunity to enjoy a high-end professional work environment, significant financial incentives, the untapped northern talent pool as well as highly motivated students, all eager to find new career opportunities. For the northern locals, it’s an amazing opportunity to benefit from exciting job opportunities in leading high-tech companies, without having to compromise their salary, professional interests level or quality of life. Our vision is to be a game changer in the northern economy, through employment opportunities – bringing back the young population of the Galilee that has left region for lack of employment opportunities, attract skillful individuals from all over the country and encourage the existing population to choose technological studies, knowing that exciting opportunities await. Moreover, talented people from Israel’s high-tech community will be able to move to the north and keep developing their careers while enjoying excellent financial conditions and high quality of life. Bar-Lev High-Tech Park invites you to join us on this meaningful journey, let’s realize this dream together! ZEISS is an internationally leading technology enterprise operating in the fields of optics and optoelectronics. For its customers, ZEISS develops, produces and distributes highly innovative solutions for industrial metrology and quality assurance, microscopy solutions for the life sciences and materials research, and medical technology solutions for diagnostics and treatment in ophthalmology and microsurgery. Additionally ZEISS is the global technology leader in the production of systems and modules that are essential for microchip production. At Bar Lev, technologies for the semiconductor industry with focus on photomask solutions are developed. Founded in 1999, Spiral Solutions is an innovative, results-driven online marketing solutions provider. Over the years, Spiral has developed a unique set of technologies and services that are highly specific and results-oriented. We’ve built up strong IP in terms of online marketing knowledge, understanding, capabilities and experience. We’ve developed novel tools and technologies which leverage the knowledge gained over the years.